Home > COMET INDUSTRIES BELTS > COMET 203583 (A-DF) Go Kart belt. > 219559A for Comet 20 Series. Drive Clutch. 3/4" (3/4 inch) bore. Replaces 203812A. Used on Comet, Manco, and Carter Go Karts. 219559A - Comet 20 Series, Manco and Carter models. Drive Clutch with 3/4" bore. Replaces Manco 2792 (MAN 2792) - Comet 203812, 203812A, 219559. 219559A for Comet 20 Series. Drive Clutch. 3/4" (3/4 inch) bore. Replaces 203812A. Used on Comet, Manco, and Carter Go Karts. Comet 219559-A Drive Clutch for Comet 20 Series. 3/4" (.75 inch) bore. Used on Comet, Manco and Carter Go Karts. Designed to replace drive clutch on 20 Series Comet Go Kart. This Drive Clutch is commonly used as a Go Cart belt drive clutch, Golf Cart clutch, People Mover clutch, and Mini-Bike drive clutch. Used on Comet and Carter Go Karts. 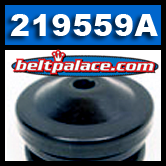 Replaces original Comet 219559 Clutch and the obsolete COMET 203812A, Manco 2792 (MAN 2792), 203812, 203812A, 219559. Genuine Comet Part Made in USA.